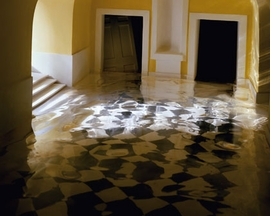 "Yellow Hallway #2" (2001) is reproduced from James Casebere: Works 1975-2010, published by Damiani. 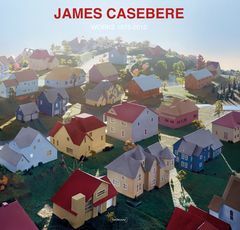 "Rocking our sense of security and danger, James Casebere probes domestic and public spaces in order to expose the porous borders between them. He introduces foreign elements, manipulating light and our visual expectations of the sacred and profane; the safe haven versus confinement; privacy versus secrecy; wilderness versus shelter. He estranges the familiar and warps the conventional in hospitals, church-inflected architecture, ordinary home furnishings, corridors, and prisons." Excerpt is from the Foreword by Toni Morrison and Ford Morrison. FORMAT: Clth, 11.5 x 12 in. / 316 pgs / 260 color.